I just hope that, however bright and blinding the veneer of fiction that covers this fabulous story, you will still be able to see through it to be historical reality that lies behind. 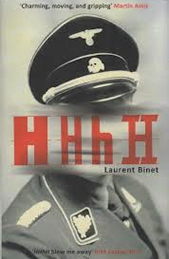 From the many books read and reviewed at Simplyreaders, HHhH has a special place, and the reason is that among all of them, the style of Laurent Binet is simply the most audacious, no more, no less. Laurent Binet tells us three stories in one, each one in a different moment in the timeline but nonetheless linked in the core: his own venture to write a book based the facts tha ocurred during the Nazi occupation of the former Protectorate of Moravia and Bohemia; the preparation of a very ambitious operation to kill the most dangerous, cruel and feared person in the Third Reich, Reinhard Heydrich and the story of this despicable man. It's the Hangman of Prague - the Butcher, the Blond Beast - who must pay. Heydrich has been appointed the head of the Protectorate of Moravia and Bohemia and it is in his hands to dismiss any sign of insurgency. The opinion is divided between the ones who accept the current circumstances for survival and the ones that prefer death rather than submission to the Reich. The author gives a fully detailed portrait of the atmosphere that rules these dark times not only in the former Czechoslovakia but the neighbor countries like Poland or Ukraine. Keep an eye on: all the emotions that Binet passed through during the preparation of the book, the short anecdotes (my favourite is about Dinamo Kiev FC) and the confessed attempts of the author to add his own season to the story. All these elements together result in a very honest and stand-alone piece of writing and journalism. How can you tell the main character of a story? By the number of pages devoted to him? Binet fights between his efforts to give the deserved praise and importance to the heroes and describe the psychology of Heydrich who is an unavoidable a magnetic character in the story. The author tells us about his internal conflict between the description of the real facts and the unstoppable intervention of his imagination that triggers more than once a shot of fiction ink. It's incredible. Almost anywhere you look in the politics of the Third Reich, and particularly among its most terrifying aspects, Heydrich is there - at the centre of everything. When I got this book, I expected a conspiracy tale, after the first page I realized that it was all about the bravery and powerful writing of a journalist. Memory is of no use to the remembered, only to those who remember.